Sweet Victory (26/365 year 3) – Annoyingly Boring? 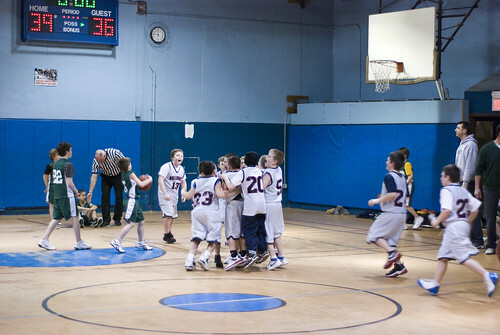 Saturday night my son’s fourth grade travel basketball team earned their first win after what has been a more than challenging season. I had hoped to get some good shots of the celebration, somewhat expecting that they would have a good shot at winning against a team that they played earlier in the year in a very tight game. The game was close the whole way though and I didn’t want to jinx them by taking out the camera too soon. Not going to go into the hall of fame as best photos, but still a capture of the moment and I am pleased to include in in my 365. And speaking of best photos, if you’d like to win a matted 5×7 of one of my better shots, you can enter to win on last Friday’s post. I’d like to say of course I noticed it, but it wasn’t until I was processing the photos that it caught my eye. It was one of the main reasons I chose this particular shot though. ← What Is It? (25/365 year 3) & A CONTEST!